It's snowing in Old Town today. There's something so peaceful about the white blanket of snow covering everything. My mixed breed hound, Daisy, is curled up by the fire in my kitchen. Mochie, my Ocicat, is sleeping in the chair next to her. Ordinarily, I would be working in my little home office, but I've moved everything to the kitchen table today so I can enjoy the cozy fireplace and the beauty of the snow coming down outside the bay window in my kitchen. I'm working on the sixtieth anniversary celebration of Amore Chocolates. It won't take place until June. At the moment, it's kind of hard to imagine a chocolate tasting outside in a garden. But I have to get going on it because June will be here before we know it! Two loaves of homemade bread are rising right now. In a couple of hours, I'll start a big pot of beef stew with potatoes, carrots, and onions. Nina Reid Norwood, Mars, Bernie, Humphrey, and Francie are coming to dinner tonight. We'll sit around the kitchen table and enjoy the cozy winter weather. Oh! And I'll be serving Chocolate Kisses! Shh, don't let on that I shared the recipe. But you might be in need of it if it's snowing where you are! Add 1/2 tablespoon of Kahlua and 1 1/2 tablespoons of peppermint schnapps to a mug of hot chocolate. Top with whipped cream and don't let anyone steal your Chocolate Kiss! What's your favorite cold weather treat? I adore hot cocoa when it is cold. Me too, Jenn! If you like the flavor of Peppermint Patties, you might want to try a Chocolate Kiss! Hot chocolate with a marshmallow or two bobbing on top. I have a hard time deciding between whipped cream and marshmallows, Dru. Maybe both! Soups find their way onto the menus during cold weather, especially chili and ham and bean soup. Other favorites would be chicken noodle and a beef vegetable soup. Ham and bean! Oh, I'm swooning! Hot chocolate! 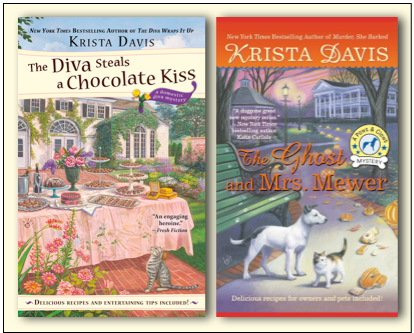 Loved "The Ghost and Mrs. Mewer" and looking forward to "The Diva Steals a Chocolate Kiss" (beautiful cover). I'm so glad that you liked it, Patricia! 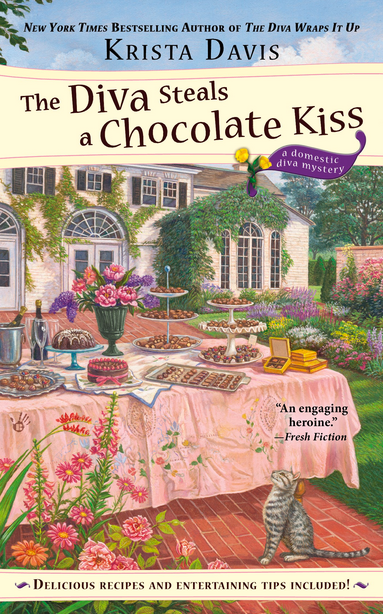 I love the cover of Chocolate Kiss, too. Teresa Fasolino is just so talented! Oh, yummy! I could use some right now! Did not know what they were called, but chocolate kisses are necesary to survive a Michigan winter. Enjoying paws and claws adventures. Thank you Robert! I'm thrilled that you like the Paws and Claws Mysteries! I want to join you for dinner! That sounds exactly what I love to have when it is cold out. Cold-weather treat? 1. Staying home from work. 2. A small cup of Irish tea (too big and it cools overly fast). 3. Reading all day (between naps). Congratulations Krista on the release of this installment! I absolutely love this series. My favorite cold weather treat is tomato soup and grilled cheese sammies. Yummo! I love hot cocoa, a soft blanket and an engaging cozy mystery when it's cold out. Your chocolate kisses recipe sounds wonderful! My favorite would be hot chocolate with either whipped cream and chocolate shavings or a peppermint stick.Your kisses recipes woud definitely be an option. I love hot chocolate when it's cold. We used to put peppermint schnapps in out hot chocolate - yum! I will have to try your recipe! Thank your for this quick "visit" with Sophie. I've miss her and can't wait for her next adventure. I'm curious how she is going to keep all the chocolate from melting outside in June! ;-) I love peppermint schnapps in my hot chocolate. I'll have to try mixing in some Kahlua as well.